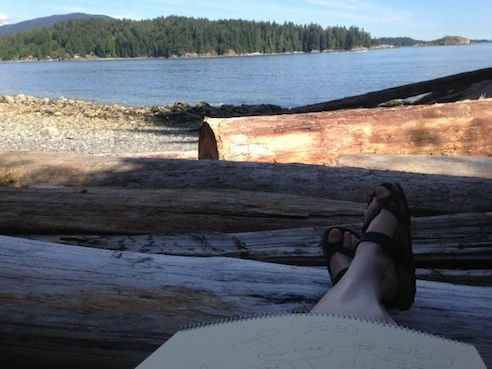 I write this column from British Columbia’s Sunshine Coast, in a little cottage overlooking the ocean. I’m alone and it’s blissfully quiet. Right now it’s a cool rainy day and my lunch is cooking in the oven. I’m here on an editing vacation. But by that I don’t mean taking a break from editing. Quite the reverse because I’m doing almost nothing else. This whole idea came about because my husband was going to sing at a week-long choral event 78 miles and a ferry ride north of here. I’d originally intended to go with him and use the spare time to work on my book. Kindly, another choir member warned me: “You might not like the food. It’s pretty basic.” So advised, I decided to stay elsewhere, at a self-contained suite, where I can cook my own meals. The tiny apartment has everything I need, including a spectacular view. But what I’m doing is editing. I have more than half of my next book written (working title: How to Write Your Crappy First Draft) and I don’t want to leave all the editing until the very end. I’d made that mistake with my last book, 8½ Steps to Writing Faster, Better, and, that time, it had taken me more than six weeks after finishing writing to screw up the courage to edit. I have fewer responsibilities. No children to attend to; no clients to help. I think the world of my clients but dealing with their issues can keep me distracted from my own. Out of town, I can turn my email to “off” and collect it only once or twice a day. I can’t manage such discipline when I’m actually working from home. In terms of my kids — even though they’re now adults — they are loud and demanding. It’s not that they need me (the “bank of mom and dad” is sufficient for most of their requirements) but if nothing else, I’m frequently on call as a chef and career counsellor. I have quiet. The people who own this apartment — a ground level suite in a house — live upstairs, but I never hear them. There are no sounds of traffic on this quiet, one-way street, yet I’m only a 10-minute walk from the beach in one direction and from a grocery store in another. I have a feeling of freedom. Suddenly, I have space around the edges of my life. When I don’t feel like editing, I can read a book or go for a walk. I don’t have to work as many hours as I do at home, which, paradoxically, makes me feel like working more. Then I can relax, really relax. But little of change or of rest. I’ll spare you the rest of the doggerel and conclude by saying that I recognize how lucky I am — in both time and money — to be able to afford this break. I’m very pleased with the editing progress I’ve made over the last few days and believe that my book will be completed earlier than I’d planned. Have you ever left town to write or edit? We can all learn from each other so, please, share your thoughts with my readers and me in the “comments” section on my blog. Anyone who comments on today’s post (or any others) by July 31/16 will be put in a draw for a copy of Far From the Madding Gerund by Mark Liberman and Geoffrey K. Pullum. To leave your own comment, please, scroll down to the section, directly underneath the “related posts” links, below. Note that you don’t have to join the commenting software to post. See here to learn how to post as a guest.